Hello everyone, Martina here, thank you for all the kind comments and messages on my previous post. Today, I thought I would share one of my samples from the last ODS on Hochanda with you today: there were so many from the whole design team that Sue and Kerri-Ann didn’t have time to show them all! 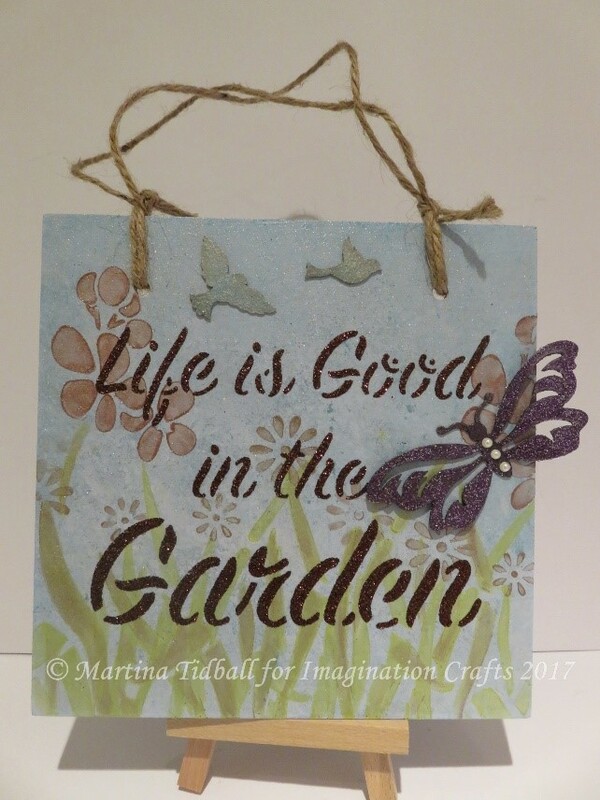 I made a plaque using a combination of stencils and the GORGEOUS new Starlight Waxes, designed to hang on the wall, shed or summer house, (if you are lucky enough to have one)! 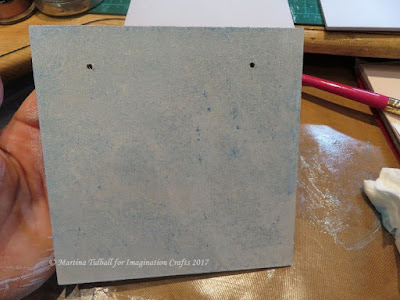 Taking one of the plaques, I added two holes using a Crop-o-Dile and base coated using Baltic Blue MDF paint. Whilst this was drying, I mixed a small amount of the Mediterranean Blue Starlight Wax, with some Magi-Paint Glaze. 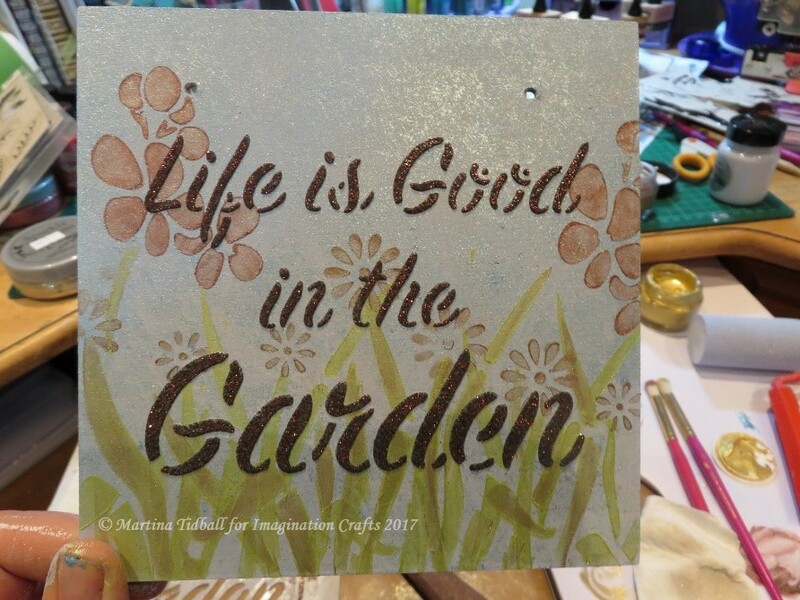 Initially I stippled my wax mix all over the plaque with a stencil brush, but did not quite get the effect I wanted. In the end, I found using an old baby wipe was the best method and gave me a mottled look to what was to be the sky. Once this layer was dry, I used the Folk Butterfly Meadow Stencil to add some of the grasses. I applied Apple Green Starlight Wax using my finger, changing the pressure to get some variation. Moving the stencil every so often, I built up the density of the grass. 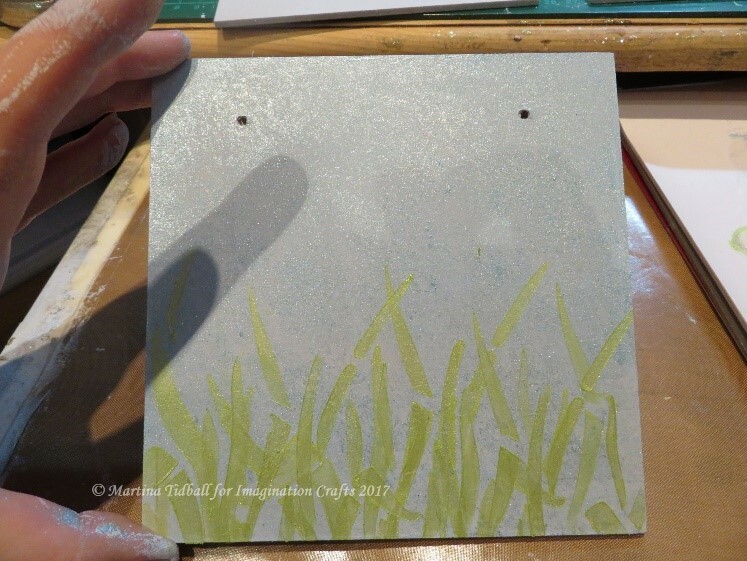 Still wanting some different tones in my ‘meadow’, I added some grass using the Diamond Starlight Wax, as well as adding some of the colour to the sides of the original Apple Green. Now to add some colour! Using my finger again, I applied Antique Pink Starlight Wax through the flower heads of the same stencil. 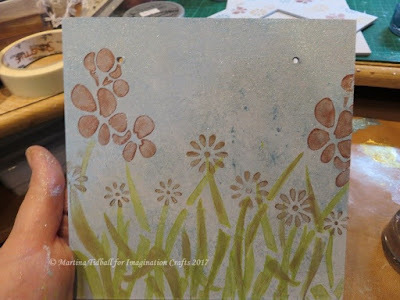 I applied this quite thickly, moving the stencil to the places I wanted the blooms to be. 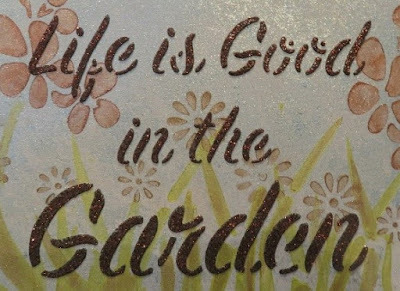 Wanting to add some smaller flowers, I picked out some of the ‘daisy’ type blooms from the ‘Life is Good in the Garden’ stencil and applied the wax in the same way. With my background dry, the next bit was to add my favourite ALL TIME product….SPARKLE MEDIUM!!! Using Repositionable Stencil Tape, I masked off the words from the rest of the ‘Life Is Good in the Garden’ stencil and placed into position. Once happy, I applied Antique Bronze Sparkle Medium with a Spatula. Once the Sparkle Medium was totally set, I decided wanted to add a little more interest, so reached for the Butterfly Art-Cutz. I chose a butterfly and applied Dark Orchid Starlight Wax to both sides. To add a bit of sparkle, I used my finger to apply some Diamond Quartz Sparkle Medium to the top and a few pearls. The final touch was to add some Art-Cutz birds from one of the other sets, painted with the Med. Blue Starlight Wax and inked on the edges to define from the sky area. Thank you for reading and I will see you again very soon!